Greatest movie ever? Monster Squad. Partially in honor of Halloween, partially because I just felt like it, Jethro and I decided to watch Monster Squad last night. Well, I decided to watch it but since I can’t work the DVD player, I just yelled “MONSTER SQUAD!” at regular intervals until Jethro put it in. Because I’m super mature. 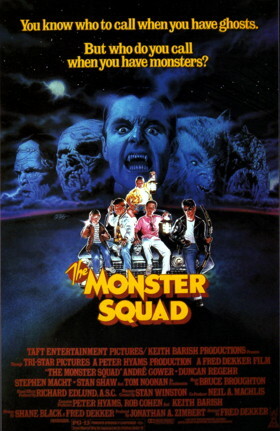 Monster Squad has always been one of my favorites, as it was on regular rotation on HBO when I was growing up. Sure, Goonies was cooler, but Monster Squad had MONSTERS. Monsters beat pirates any day. It’s campy, it’s cheesy, it’s full of plot holes and it’s so much damn fun. 1. Phoebe? ADORABLE. Phoebe and Frankenstein? MELT. 2. Rudy coming to the rescue of Horace. The leather jacket, lighting the cigarette off his shoes, making the kid from the Wonder Years eat the squished candy bar off the ground? And later where he shoots the vampire girls with a bow and arrow? Six year old me swooned. 3. Dracula? SCARIEST BAD GUY EVER. According to IMDB, her scream at that line was real; the actor playing Dracula never wore his fangs or red contacts around her because it scared her too much, so when he lifted her up and opened his eyes at her, she understandably freaked and probably pooped her overalls a little. And I might have too. Seriously, he’s one of the best Dracula’s. And vaguely hot, now that I’m older and not terrified of him. No effing sparkly vampires here, NO SIR. “Well, Steve, but he doesn’t count. And he stumble to where she’s hiding and holds her hand as he says goodbye and slips away into limbo. 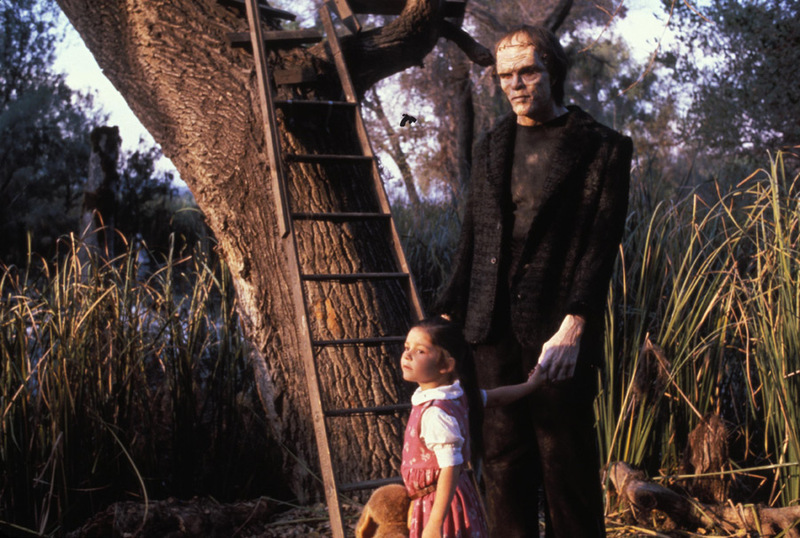 AND THEN SHE THROWS HER TEDDY BEAR TO FRANKENSTEIN!! And I collapse in a puddle of sentimental goo. 8. And, of course, the best part. I hear they’re remaking it, but I call shenanigans. You can’t remake perfection. So? Your thoughts on Monster Squad? What’s your favorite cheestastic Halloween flick? *Photos from here, here, here and here. 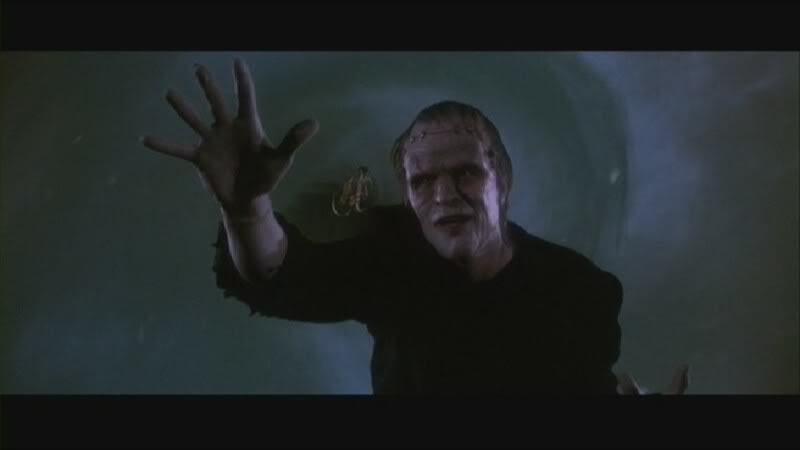 October 31, 2011 5 Comments Short URLchildhood favorites, Dracula, Frankenstein, Monster Squad, movies, nostalgia, Van Helsing, video, youtubeGeekery, Movies, The Internets, TV, WATCH THIS! haaahahah I love bad horror movies. even though you SPOILERED this one so hard, I still must see this movie. I will suggest it for next year’s bad horror movie party! my current favorite: black sheep (genetic engineering gone horribly wrong). also good: attack of the killer tomatoes (ridiculous 70s movie), and fido (recent zombie comedy). Statute of limitations on spoilers is totally up if they’ve released a 20th anniversary DVD…and if there is barely a discernible plot. Plus I didn’t think about that. I’ll put a note up. But ONLY if you promise to watch this. Maybe tomorrow if you’ve got plans. At LEAST by this weekend. As an adult, this is my favorite scene. HILARIOUS.